As you motor along the freeway-like stretch of La Cienega Boulevard that weaves through Baldwin Hills, it’s the barren hilltops dotted with rusted pump jacks that grab your attention, not the blink-and-you’ll-miss-it entrance to Kenneth Hahn State Recreation Area. But keeping to itself has always been the 338-acre park’s MO. Established in 1985 and named in honor of the longtime county supervisor who helped transform oil fields into a beautiful public space, the manicured property is one of most spectacularly undervalued retreats in L.A.
Crisscrossed by seven miles of hiking trails and featuring expansive lawns, oak and eucalyptus groves, a trout-stocked lake, a Japanese garden, and some of the city’s most cinematic views, it boasts most of the amenities of Griffith Park with a fraction of the fanfare: Largely overlooked by residents north of the 10, the park is shockingly crowd-free, even on weekends. Covering the whole thing requires a full day at least, but this highlight reel will start you of on the right foot. The park’s western section was the site of the first Olympic Village, 550 houses built by H.O. Davis when L.A. hosted the games in 1932. Today it’s home to the Olympic Forest, a grove planted with at least one native tree from each of the 140 nations that participated in the 1984 games (date palms from Egypt, sea hibiscus from the Seychelles, sweet bay from Greece). 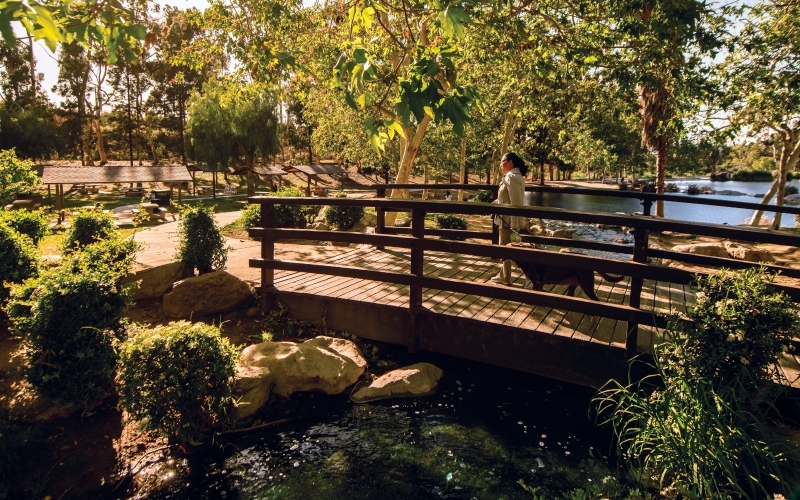 A short walk away, Doris Japanese Garden presents meanderers with a lily pad-dotted koi pond and a Meiji-style gateway. The broad, grassy hollow looks like an overgrown crater, but it’s actually the terraformed remnants of the Baldwin Hills Reservoir. (Decades of subterranean drilling were thought to have led to the dam’s wall buckling in 1963.) Show up in your tennies: At just under a mile, the Bowl Loop offers a pleasant, low impact stroll around the rim. For eye-popping panoramas, head past the secret waterfall near the park’s northern edge. After huffing along a few switchbacks that take you up nearly 450 feet in elevation, you’ll come to a series of three lookouts. With sweeping views from Santa Monica Bay to the San Gabriel Mountains, each vantage point is selfie-worthy, but the final stop, Christine’s Point, proffers the most primo vista.